Mint Green and Shell Pink. 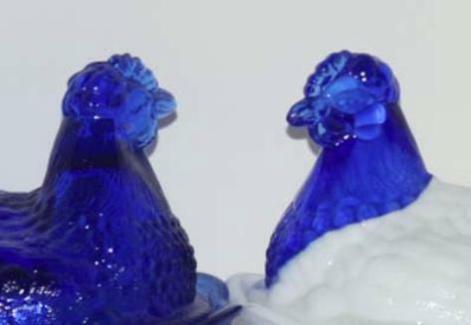 key factor for identifying which hens are Fenton, and which are not. Fenton logo first quality wares are marked with. (12.03.13). Fenton's various hen on nest dishes, from their silhouette. 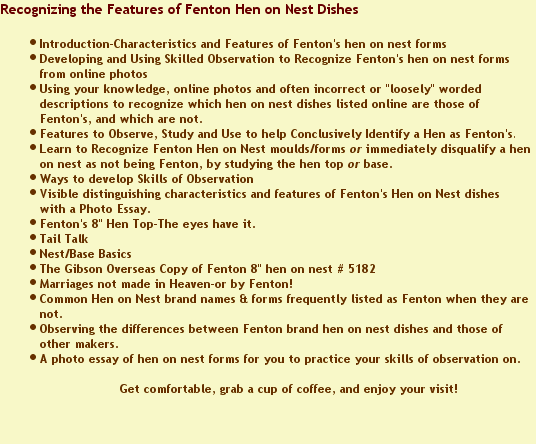 obvious features of Fenton's hen on nest dishes, which we've addressed below. 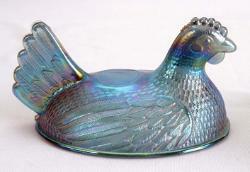 Online listing errors for glass hen on nest dishes are fairly common. Knowledge is the best way to fight ignorance. 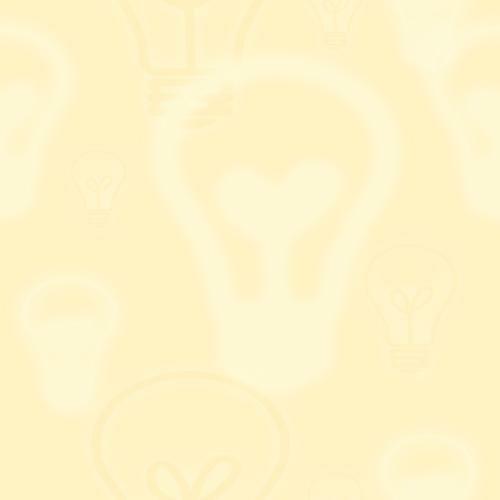 used when trading online with Sellers, many for the most part who are strangers. eBay auction-prior to launching it. But, don't count on it! Many Sellers have "clauses"
Buyer's responsibility when eBay's rules for listing items clearly say otherwise. Gibson Overseas copy are included at the bottom of this section. Still, this is a great first step to take. Fenton and avoiding a "fowl" purchase. 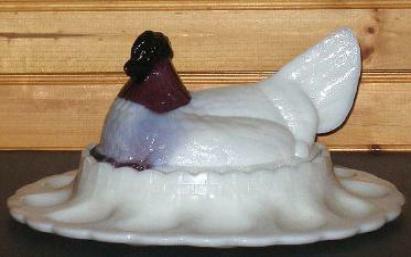 The overall shape and size* or "mould" of the Hen on Nest with the top on the base. scalloped look to the edge(s)? note the angle the tail departs the back-does the tail rise steeply, or flatter and closer to the back? 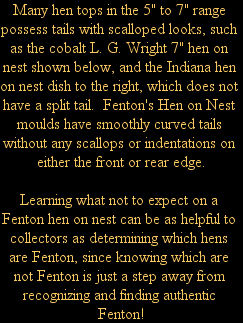 The nest or base can also provide many clues as to whether a hen on nest is Fenton, or not. 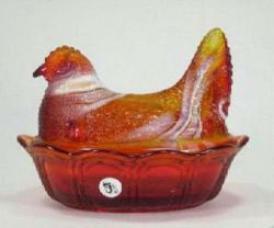 Fenton's 8" hen tops #5199 sit on basket woven nests. retired in 1958, or late in 1957 as some claim.  double strands that cross over and under each other. used with hens in the 5 to 7 inch range. 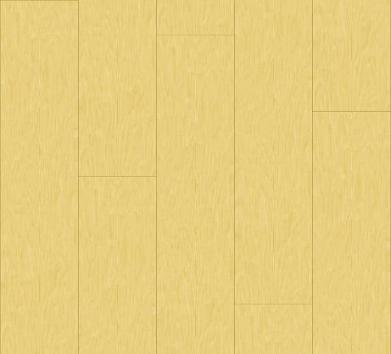 photos and angles as you can find! Shown #5188 YZ, LE to 950 pieces. 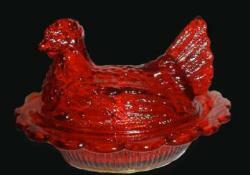 which are very different from Fenton's. base, which appears unique when compared to those of the other hen on nests. of them are produced from moulds bought or leased from other companies. 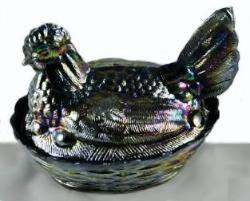 8" hen top #5199 is used with 3 different bases with each combination forming a new Hen on Nest ware. 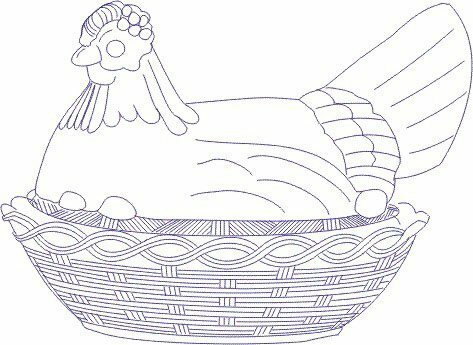 illustrate many features and characteristics these hens are known for. Fenton's 8" Hen on Nest #5182 for photos and more information about them. COPIES & Marriages for details and photos. basket woven) Nest, YOP 1996. 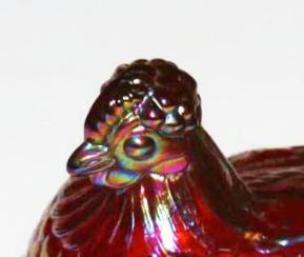 The 8" Atterbury hen top with red Glass eyes. 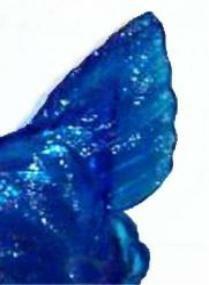 different in appearance with an almost richer blue coloring to it-despite the photos below which don't support that. 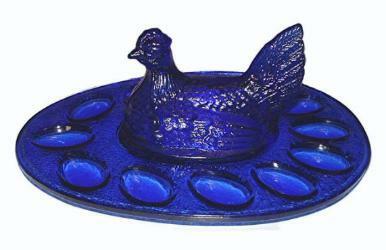 Servers, Hen Egg Plates, and on two versions of basket woven bases-the smooth and scalloped rimmed. 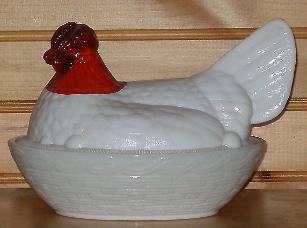 the original 8" Atterbury hen. SL, by Special Order for Martha by Mail in 2000.
ware # 5183 MY produced in 1953. The eyes (& more!) have it! 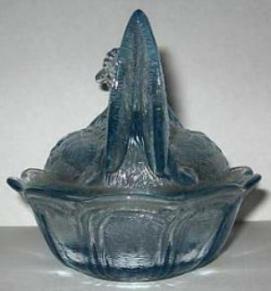 Among one of the most readily visible, and interesting characteristics of Fenton's 8"
to use diagonal slashes that all run in the same direction. Plate have not been retired. 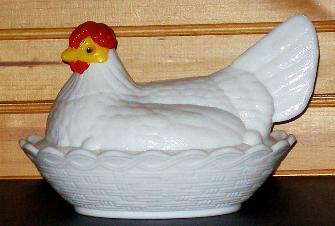 form of a massive Chicken Server. 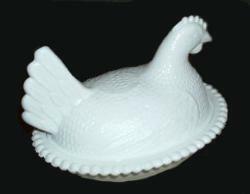 Fenton's first hen top was a copy of the 8"
production of that Fenton hen top. 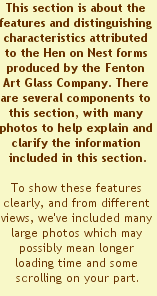 when Fenton began marking all their wares with logos embedded into the glass. nest made by Fenton. Please use the links to go to those pages. 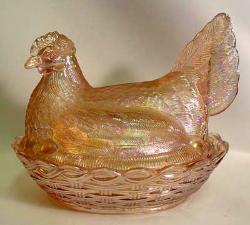 to have been used on basket-woven bases are the 8" Fenton hen tops. renowned, big bulging eyes of the 8" Fenton hen top. in the 1950's, with a smooth rim base. 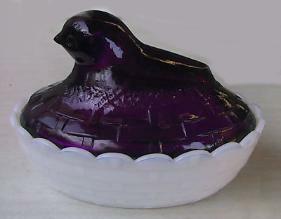 Shown above is Fenton ware #5183, an Amethyst & Milk Glass Hen top and the smooth rim base, also Milk Glass. 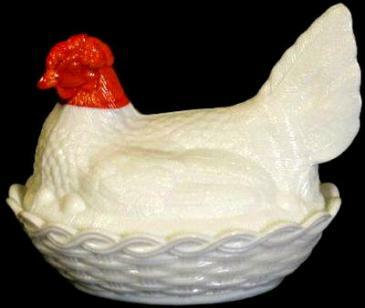 Fenton's revised large, 9" hen on nest introduced in 1967 features a basket-woven base with a scallop rimmed top. 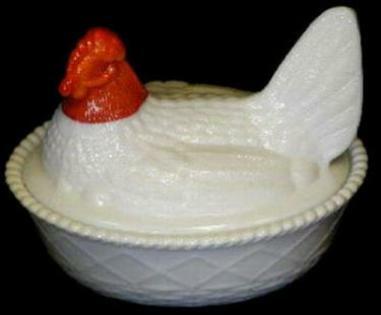 the right), as well as on the Chicken Servers of the 1950s (see top of page), and the Hen Egg Plates made from 1995 to present day 2011 had not been retired, when Fenton ceased making new wares. top combination, and maintained it as their own, despite some controversy surrounding its actual origins. 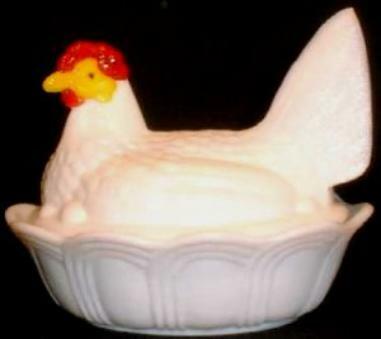 moulds used for the hen on nest dishes produced by Fenton as of January 2008.
large and small Fenton Rooster boxes, covered in the Rooster Box section. 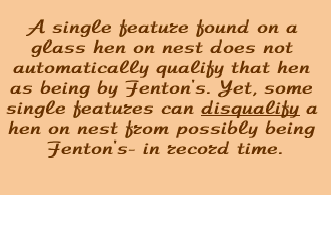 of Fenton's hen on nest forms do. right. A Fenton 8" hen's tail is pictured below center with the painted Daisies on it. To the far right is the tail of a Fenton 5"
5" hen's tail rises more steeply than the 8" does and has an overall different shape to it, although they are both split tails. NOTE: Items made for QVC have the letter "C" prefix in front of the ware #. 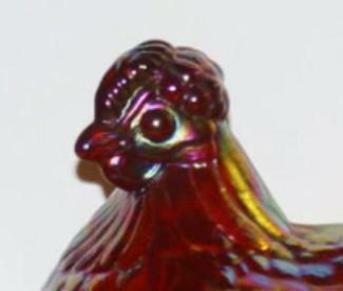 other hen tops in the 5 to 7 inch range are very well detailed, complete with pupils and eyelids. 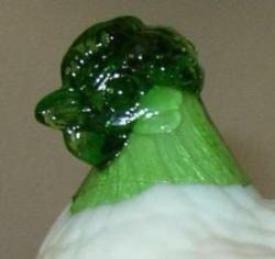 do not have detailed eyes, but instead big, round bulging eyes that are void of all detail. 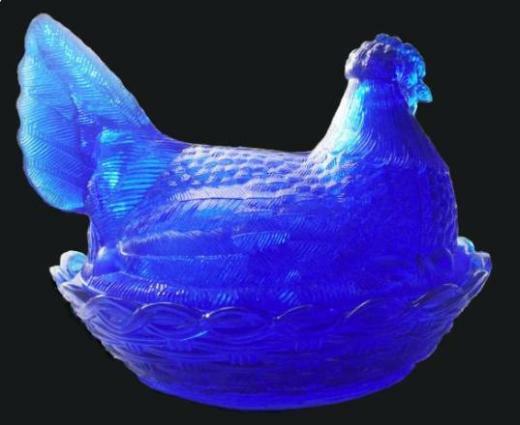 The Cobalt Hen below is not Fenton. What visual clues can be used to help determine which, if any of these 3 red and white hens are Fenton? 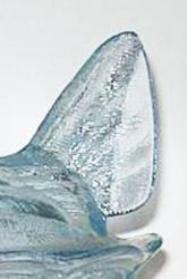 edge of the tail, with less obvious longer curves along the front edge of the tail as well. 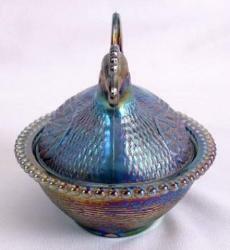 tops with big, round bulging eyes sit on basket woven bases and egg plates. 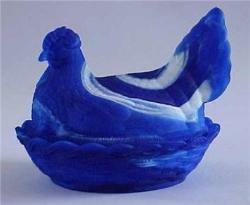 2) The egg placement, top of tail, wing design, and cowl are also unlike any of the Fenton hen top moulds. 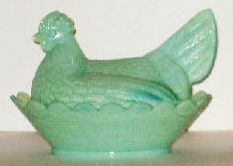 Fenton hen top used on a basket woven style base. 3) Note the details and styling of the "basket woven" base.  twist to the rim design. 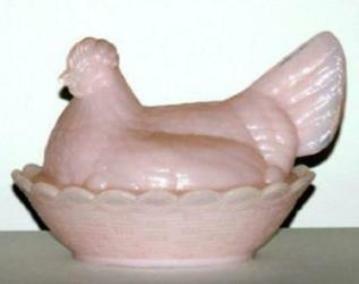 4) Proportion of the base to the hen top. 1) The hen on nest shown below right has an overall size and style that is closer in form to Fenton's 5" hen on nest #5186. WMG moulds when they went out of business continue using them. 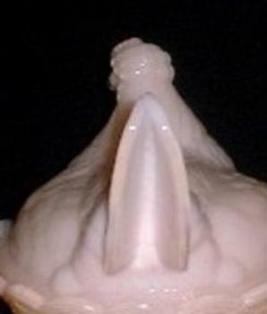 the overall shape of the head, beak, and cowl differ from Fenton's hen on nest dishes. 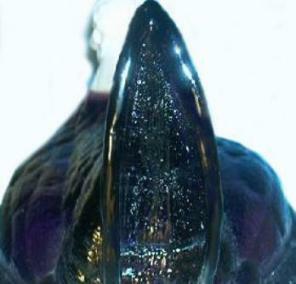 the angle of the tail and the type of base used. than likely not earn back funds spent to buy it. authenticity of any item they elect to list by a brand name. 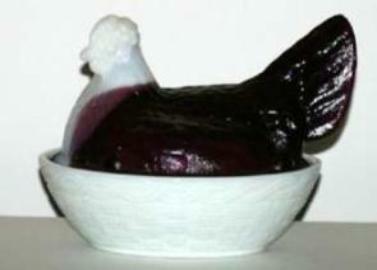 bottom of the hen top. 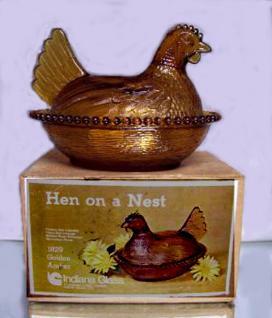 see the section about Hen on Nest #5186 for details. But not all chickens are hens. males. Yep, its that simple. Fenton's Chick on Nest, # 5185. 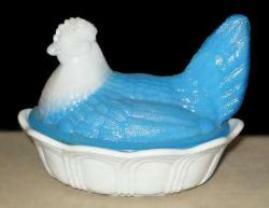 Fenton did not have any viable Rooster moulds. 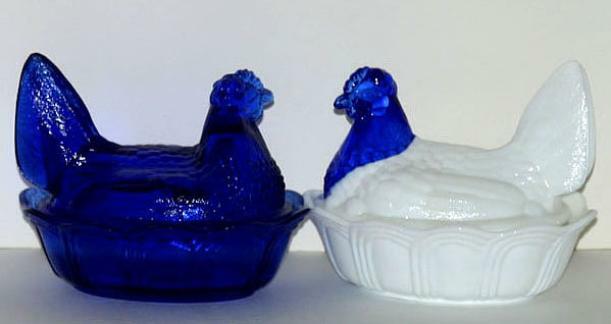 non-Fenton hen on the far left, to Fenton's hen tops' tails shown to in the center and on the right. decorative patterns, called "English Daisy." 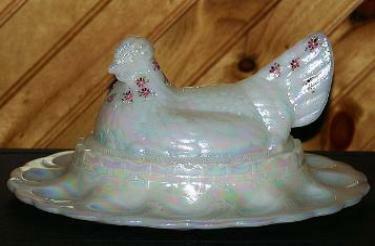 This 8" Fenton hen top is known for her bulging eyes. To the far right is a photo of ware #5186 LR, the 5" Fenton hen on nest, in Misty Blue's tail. curved, and without a scalloped appearance. lay-off than a permanent retirement. Edition, again decorated with a beautiful painted design. 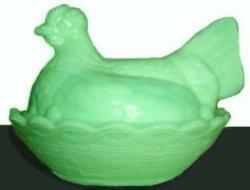 Mail also ordered Hen Egg Plates from Fenton in Jade and Pastel Pink. 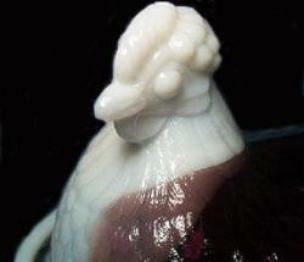 carnival, and below in white. details, and lists with photos of the colors they are known to have been produced in. and a base /nest of different brand, color or size. 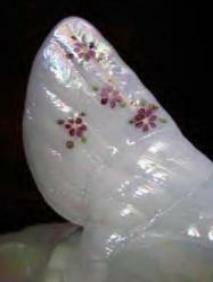 in milk glass shown below the others these differences are easier to see. 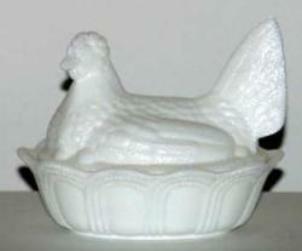 slightly from the base so the rim's design of the hen top is more easily seen. hens, and for record keeping. Please have patience as the site, its pages & many photos load. 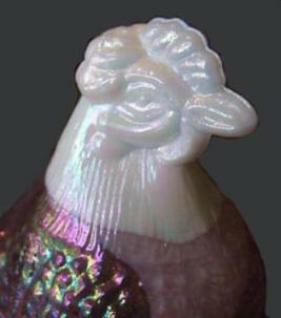 choice of glass color and type, with the absolute intention of these wares being marketed by L. G.
detailed eyes, and its base which also differs greatly from those used by Fenton. hen on nest base shown here. be distinguished, please see the information below. chickens, do have their visible differences. and rooster forms. 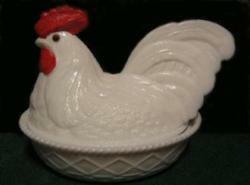 Because all Fenton roosters should be marked, its Ladies First! eBay or any individual, named or unnamed. media listed in this site's Bibliography. 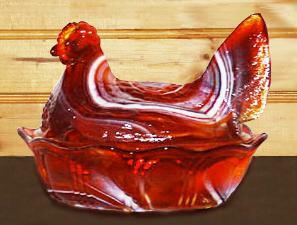 and appears "flatter" than the authentic Fenton hen. 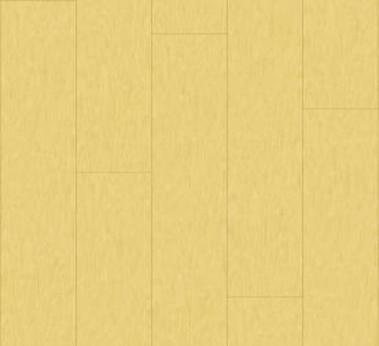 space diagonal slashes on the Gibson Overseas hen top. Fenton's, and which are not. 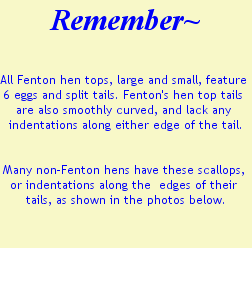 Features to Observe, Study and Use to help Conclusively Identify a Hen as Fenton's. 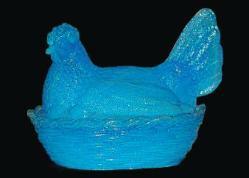 hen on nest as not being Fenton, by studying the hen top or base. 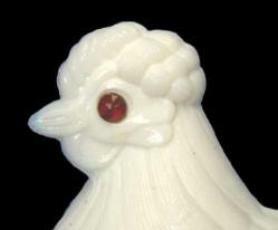 Fenton's 8" Hen Top-The eyes have it. Marriages not made in Heaven-or by Fenton! 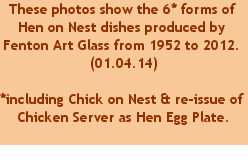 A photo essay of hen on nest forms for you to practice your skills of observation on. Get comfortable, grab a cup of coffee, and enjoy your visit!